SCVHistory.com GT8803 | Saugus Speedway | Owners Demolish Historic Bonelli Ranch House, 2-6-1988. February 6, 1988 — Fearing the brand-new City of Santa Clarita might try to force them to save it, the heirs of Saugus Speedway founder Bill Bonelli demolish the historic Bonelli House. The city had incorporated seven weeks earlier. Photos by official Saugus racing photographer Gary Thornhill. Located on the grounds of Saugus Speedway, the 5,600-square-foot adobe ranch house dated to the early 1920s when the property was the Baker Ranch. In the early 1930s it was owned by Western actor Hoot Gibson. In fact, this house was where Gibson married his third wife, Sally Eilers, on June 28, 1930. The house featured beamed ceilings, three fireplaces, tile work, parquet floors, and an adobe-brick swimming pool that was also bulldozed. "They wanted it torn down before the new city can enact a law that would prevent the destruction of historical buildings," a demolition worker told The Signal. "The house was absolutely fantastic. I'm glad I got to see it before it was torn down." It would be another 20 years before the city adopted a historic preservation ordinance, and it was soon modified such that it protected only seven buildings in downtown Newhall, along with the oldest, original section of Melody Ranch in Placerita Canyon (plus the buildings that were already protected by the SCV Historical Society in Heritage Junction Historic Park). 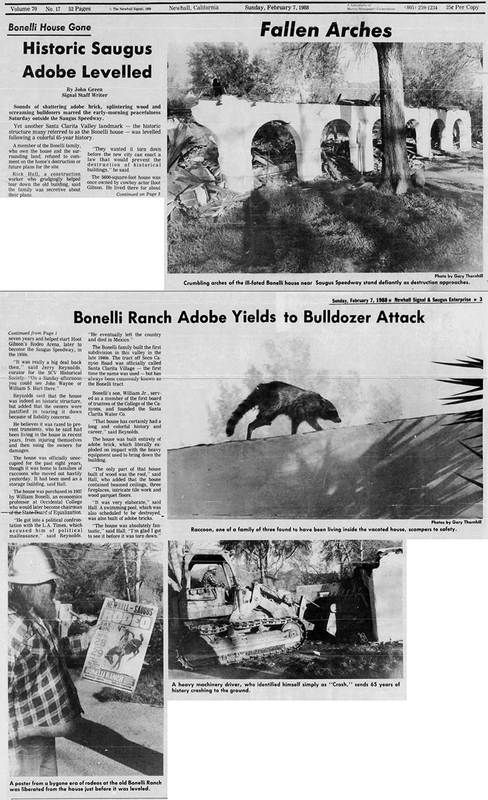 Bonelli Ranch Adobe Yields to Bulldozer Attack. The Signal | Sunday, February 7, 1988. Sounds of shattering adobe brick, splintering wood and screaming bulldozers marred the early-morning peacefulness Saturday outside the Saugus Speedway. Yet another Santa Clarita Valley landmark — the historic structure many referred to as the Bonelli house — was levelled following a colorful 65-year history. A member of the Bonelli family, who own the house and the surrounding land, refused to comment on the home's destruction or future plans for the site. Rick Hall, a construction worker who grudgingly helped tear down the old building, said the family was secretive about their plans. "They wanted it torn down before the new city can enact a law that would prevent the destruction of historical buildings," he said. The 5,600-suare-foot house was once owned by cowboy actor Hoot Gibson. He lived there for about seven years and helped start Hoot Gibson's Rodeo Arena, later to become the Saugus Speedway, in the 1930s. "It was really a big deal back then," said Jerry Reynolds, curator for the SCV Historical Society. "On a Sunday afternoon you could see John Wayne or William S. Hart there." Reynolds said that the house was indeed an historic structure, but added that the owners were justified in tearing it down because of liability concerns. He believes it was razed to prevent transients, who he said had been living in the house in recent years, from injuring themselves and then suing the owners for damages. The house was officially unoccupied for the past eight years, though it was home to families of raccoons who moved out hastily yesterday. It had been used as a storage building, said Hall. The house was purchased in 1937 by William Bonelli, an economics professor at Occidental College who would later become chairman of the State Board of Equalization. "He got into a political confrontation with the L.A. Times, which accused him of political malfeasance," said Reynolds. "He eventually left the country and died in Mexico." The Bonelli family built the first subdivision in this valley in the late 1940s. The tract off Seco Canyon Road was officially called Santa Clarita Village — the first time the name was used — but has always been commonly known as the Bonelli tract. 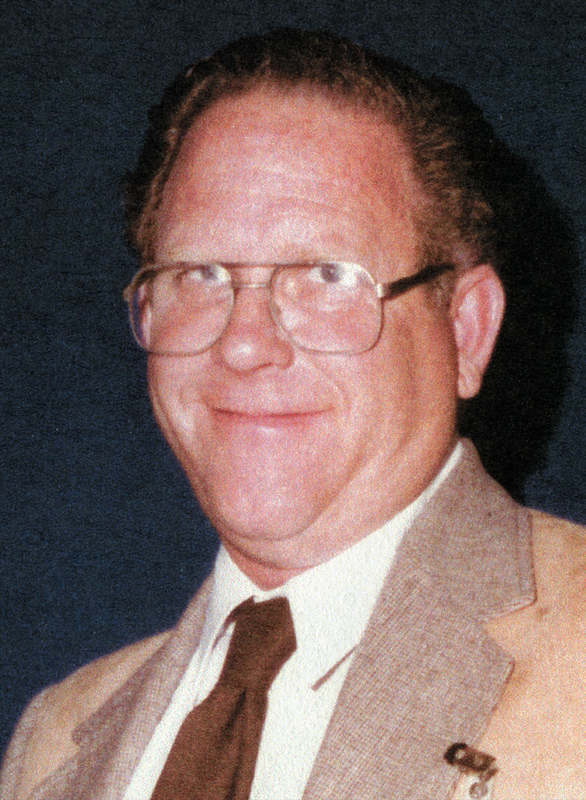 Bonelli's son, William Jr., served as a member of the first board of trustees of College of the Canyons, and founded the Santa Clarita Water Co.
"That house has certainly had a long and colorful history and career," said Reynolds. The house was built entirely of adobe brick, which literally exploded on impact with the heavy equipment used to bring down the building. "The only part of that house built of wood was the roof," said Hall, who added that the house contained beamed ceilings, three fireplaces, intricate tile work and wood parquet floors. "It was very elaborate,' said Hall. A swimming pool, which was also scheduled to be destroyed, was also built of adobe brick. "The house was absolutely fantastic," said Hall. "I'm glad I got to see it before it was torn down." GT8803: Download larger images here.